The first time I caught a glimpse of the astronomical imagery in the Mass Effect video games, I was blown away by how realistic everything looked. While the plot of the games is solidly science fiction, the setting has an impressive level of realism. You can explore nebulae and star systems, collect data about exoplanets… and so much of the imagery looks like something straight from a NASA press release. 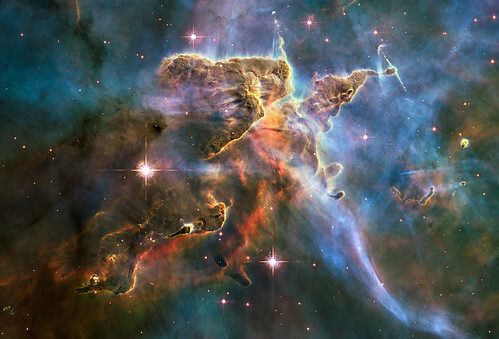 Compare the fictional “Kite’s Nest” from the game (above) to Hubble’s shot of the Carina Nebula (below). Some of the astronomical objects featured in the game are even real ones! I began to suspect that the game’s developers may have had some serious NASA-based inspiration. Increasingly curious about the astronomy within the Mass Effect universe, I contacted BioWare and had my questions answered by the series’ Executive Producer, Casey Hudson. Sara Mitchell: The “geography” of Mass Effect is an interesting mix of realism and fiction. Some of the places that you can zoom through or visit are real astronomical objects (like the Horsehead Nebula, Eagle Nebula, and Hourglass Nebula). Many others appear to be made up entirely. How did you choose the objects to include in the game – real and fake? Casey Hudson: We tried to include real-life locations wherever possible, such as famous nebulae, stars, the moon etc. Part of the goal with the Mass Effect universe was to set it in the real world, so that even as we created storylines of epic scale and exotic science-fiction themes, it would all appear to be an extension of the astronomy that you can read about today. The underlying idea was that real-life scientific discoveries consistently create imagery and concepts that blow away previous notions of what is possible, from the surprising effects of dark matter on the universe, to the thick veils of purple atmosphere around Titan. If real-life astronomy can reveal such stunning ideas and imagery, that gives us a certain creative license to suggest that reality will continue to be stranger than fiction. CH: The imagery in the Mass Effect universe is inspired by real-life photos, ranging from orbital photographs from the shuttle, to wide field Hubble images. In the game however, players typically move through the galaxy in a 3-D perspective, so we paint unique art assets that can be assembled to create the illusion of a galaxy with stars, nebulae, etc. These individual 2-D images are typically painted in photoshop, then are combined in the graphics engine to create a sense of depth and parallax. So even though it appears you are flying past the Horsehead Nebula, you’re actually navigating in between several gauzy layers of paintings created by BioWare artists. SM: One of the biggest emerging fields in astronomy is the study of exoplanets (planets orbiting stars besides our own Sun). There are many such planets in the Mass Effect games, and there’s a lot of detail about their properties. How much of this was based on information about real exoplanets that have been discovered? If the information is fictional, how was it created? CH: The sheer number of planets we would need to create for the Mass Effect universe and its various exploration systems required us to develop a more automated means of generating them. To get us started, I made an excel file that would spit out random planets, along with a made-up name and statistics about its size, orbital period, surface temperature etc. It was crude, and not meant to withstand any serious scientific scrutiny, but it was based on some basic astronomical and mathematical principles that provided reasonably believable results. You would fill in a cell to tell it what class of star the planet would be orbiting, then the system would start working through a sequence of planet building: randomized distance from the star, appropriate composition, atmosphere, etc – referring to various available charts and graphs about composition probabilities and temperatures etc. along the way. It would then list the resulting stats on the planet so that designers could use them in the game. The funniest part was that it would create a fictional name, by randomizing and concatenating several lists of word segments. The names were strange, but it worked surprisingly well! 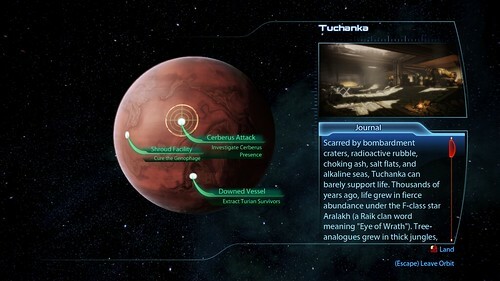 The designers and writers would still do a lot of work to massage the results or sometimes create their own planets manually, but this gave us a good way to make a basic Mass Effect planet. SM: The games also include a lot of real science when discussing how things work – fairly detailed information about Doppler shift, relativity, and mechanics. What inspired you to include this level of detail? When you’re creating works of science fiction, how do you decide how much science to include in your fiction? CH: Our approach has always been that we need to know how everything works in the Mass Effect universe, but players shouldn’t be required to. That ensures that the fictional world feels like it makes sense and is based on something real, but you don’t need to understand all the science to appreciate the story. We try to keep the story’s focus on classic human themes – love, betrayal, revenge, etc. – while setting those intimate emotions against an epic and believable science-fiction backdrop. We then provide lots of the scientific discussion through our in-game Codex and side conversations, where people can enjoy them as fun additions to the experience. SM: Who writes the scientific and technical content for the games? Does the Mass Effect team include a lot of space geeks? 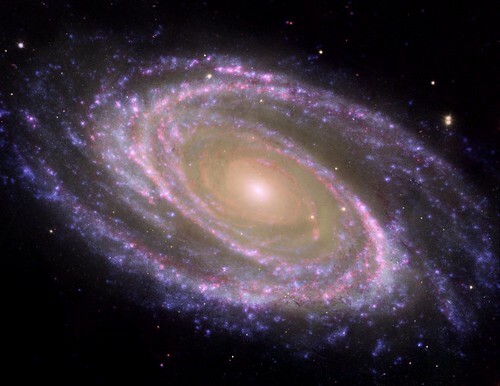 CH: We have several writers who are very interested and knowledgeable in science and astronomy, and they are constantly consuming new information about technology and space. They bring that knowledge to their work on the Mass Effect series, and that has been extremely useful in providing the wealth of background information that makes everything work under the hood. We have also credited “Special Thanks” to biomedical engineers and physicists who provided feedback on some of the Codex entries. To ensure consistency, we designate a specific writer (originally Chris L’Etiole and now Chris Hepler) to create much of the scientific descriptions and serve as our content supervisor. Many people contribute to the growing story of Mass Effect, but it’s extremely useful to have one person who knows how all the details of the fiction come together in a consistent fictional universe. SM: What fiction from the Mass Effect games would you like to see become reality in the future? CH: What I’m most excited about is dark energy. When we started the series, I saw it as an incredibly exciting piece of empty real estate, left by gaps in contemporary science. 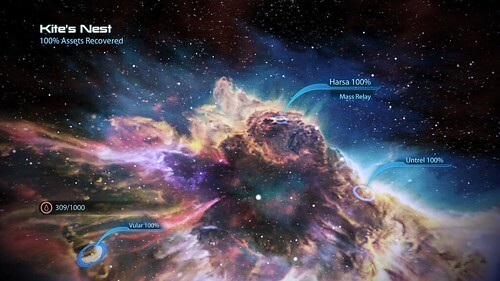 The basic idea being that when astronomers were finally able to measure the rate of deceleration of the universe’s expansion, the result was that the expansion is not decelerating – the universe is accelerating away from itself, apparently due to the effect of dark energy/matter. This is an incredibly exciting story that is still developing in real-life headlines today – and for us it opened up amazing possibilities for fictional storytelling. In particular, it gave us a basis for much of the technology in the Mass Effect universe. If we could eventually understand and manipulate dark energy the way we have mastered electromagnetism, what technologies might result? The Mass Effect universe is our answer to that question, but I suspect this is another example of how reality may prove to be stranger than fiction. The attention to scientific and overall detail in the Mass Effect series is astounding. Thank you for writing this article. Keep up the fantastic work!